Considering Afghanistan’s mountainous and formidable terrain, air support during counterinsurgency operations is vital. Just this past August, Afghanistan received delivery of the final four out of 27 MD-530 Cayuse Warrior helicopters from the U.S. Air Force. 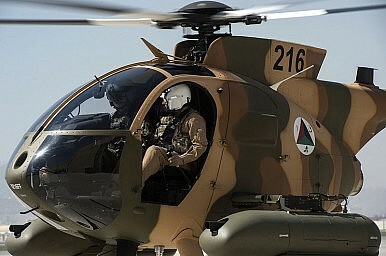 On Thursday morning, four of those aircraft were delivered to the Shaheen Military Corps in northern Balk province. Presiding over the ceremony in Mazar-i-Sharif was Afghan Air Force Chief General Abdul Wahab Wardak, who lauded the delivery as strengthening the Afghan Air force. Afghanistan has struggled to field a competent air force over the years, somewhat in part due to U.S. delays in building and training the new unit. An air force for any country is expensive, and for a country like Afghanistan that translates into fielding aircraft that the war torn region can afford to maintain and equip. Mi-17 helicopters provide transport for Afghan forces conducting night time raids on suspected Taliban insurgent leaders, providing speed, swiftness, and an element of surprise. Even more important, however, is the ability to provide medical casualty evacuation (medivac). Poor medivac capabilities drain force morale, but also increase casualty rates and deaths from non-fatal injuries and bleed outs. Afghanistan has struggled since the drawdown of NATO forces began to maintain proper medivac standards. It is currently unknown what the current capabilities with regards to this capacity are, as the latest SIGAR report (from 2015) to mention Afghan medivac capabilities remains classified. However, the drawdown of Coalition forces has had an impact on Afghanistan’s ability to conduct counternarcotic (CN) interdiction operations as critical enablers such as quick reaction forces, close air support, and dedicated medical evacuation support are no longer available. The ability to drop heavy munitions from the air or to conduct rapid fly overs and show of force operations impact both friendly and hostile units. As stated earlier, morale and psychology are key elements of success on the battlefield. The collapse of Mosul in Iraq to a far smaller attacking force highlights this point; exposure to social media that indicated a mythical and unbeatable ISIS force caused Iraqi units to abandon their posts. Afghanistan’s A-29 Super Tucanos provide a new capability to Afghan forces that is pivotal to forces conducting counterinsurgency operations, which is the ability to target insurgent leaders with precision strikes. The A-29 is capable of fielding GPS guided munitions kits similar to what the United States fielded in Colombia, as it assisted the central government in eliminating FARC leadership. Fast forward to the present day, and through a campaign of targeted strikes and the decimation of FARC’s leadership, the leftist guerrilla outfit recently signed a peace accord, ending the 50 year long conflict. The Pentagon has extended a procurement contract for the Afghan Air Force’s A-29s until 2024.